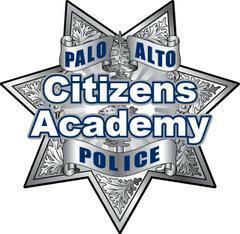 This spring, after a hiatus of 10 years, the Palo Alto Police Department is bringing back the Advanced Citizens Police Academy, a series of one-night-only educational classes for graduates of our popular Basic Citizens Police Academy. The seminars offered in the Advanced Citizens Police Academy are three hours long, and focus on a single topic within law enforcement. The instructors are employees of the Palo Alto Police Department who have expertise and experience in their topic. Whereas our Basic course provides a high-level overview of a broad topic (e.g. detective work), an Advanced course will provide a focused in-depth look into one specific element of that topic (e.g. sexual assault investigations, interviews and interrogations, or forensic medical examinations). We intend to offer a new Advanced class every four to eight weeks. Topics may include SWAT operations, police canine work, crime scene investigations, traffic enforcement, search warrant preparation, responses to in-progress incidents, identity theft prevention, efficiently recognizing and reporting suspicious behavior, and protecting children from online sexual predators. The Advanced courses are only offered to graduates of our Basic curriculum and are not open to the public. People who live or work in Palo Alto or the immediate surrounding community are welcome to apply to attend our Basic Citizens Police Academy, which we offer three times a year. Those courses begin every January, April, and September. The application period for the April 2019 Basic Citizens Police Academy is currently open, and closes on Wednesday, March 13. For more information and to apply, visit this link: https://www.cityofpaloalto.org/civica/press/display.asp?layout=1&Entry=1692. Within the next two weeks, the more than 450 graduates of our 31 Basic academy classes will receive invitations to attend the first Advanced class, which is currently scheduled for April 2019. Graduates can choose to attend any or all of the Advanced classes they would like, depending on their level of interest in the topic. Police will send invitations to the Basic academy graduates as new Advanced courses are scheduled and announced. The Palo Alto Police Department first offered its Basic Citizens Police Academy in 1995, and over the course of the next 14 years, ran 24 classes that produced more than 350 graduates. Several of those graduates went on to become volunteers with the police department, and others even went on to become career police officers. The Department began to offer Advanced classes for the first time in 2006. All of the Citizens Police Academy programming was discontinued in 2009 due to staffing reductions within the Police Department, but made its return in the fall of 2016 with a completely redesigned curriculum. Since then, six classes have graduated, with the seventh finishing next month. For more information about either the Basic or Advanced Citizens Police Academy, send an e-mail to pd@cityofpaloalto.org.